Join our monthly webinar for a quick review on Cloud Access Software followed by a Question and Answer session with our Cloud Access Software expert and Solutions Architect Jonathan Culver. 1.What graphics adapters does Cloud Access Software support? 2.What Windows versions does Cloud Access Software support? 3.Can USB devices be used with Cloud Access Software? 4.What are the supported hypervisors and cloud platforms for Cloud Access Software? 5.Can I connect to my Cloud Access Software workstation on a tablet device? Submit a question when registering or during the webinar. Our goal is to ensure your deployment is a success! Join our monthly webinar for a quick review on Cloud Access Software followed by a Question and Answer session with our Cloud Access Software expert and Solutions Architect Jack Liu. 1.What applications does Cloud Access Software Support? 2.What are the bandwidth requirements for Cloud Access Software? 4.How do I configure/optimize Cloud Access Software? 5.How do I broker Cloud Access Software? Access Software on the public cloud? Join Teradici and Microsoft for a glimpse into how scalable desktop resources in the cloud can help in education. In this webinar, you'll learn how education institutions can leverage virtual desktops in the cloud to provide improved computing resources to students, strengthen security, and help make university IT operations more efficient. Teradici Cloud Access Software and Microsoft Azure enable a solution that will solve today’s desktop management challenges and drive improved access for students, personalized learning, and improved student outcomes. 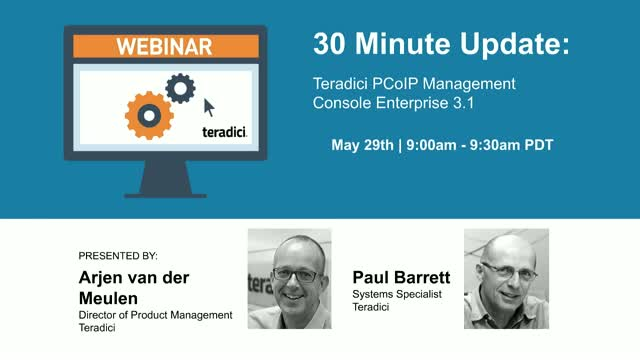 Don’t miss this webinar and a chance to learn how you can get started with Teradici and Microsoft. Join us for a 30 minute overview and Q&A session with our Teradici Cloud Access Software Product Manager Mirela Cunjalo. We will share the use cases and benefits of delivering desktops and workstations with Cloud Access Software and its latest features, including the new brokering and provisioning service. Are your users tired of having to login to the corporate network via VPN? Do you wish you could manage at-home devices remotely? In our latest release of PCoIP Management Console, we’ve added the ability to manage both office-based and at-home PCoIP Zero Clients. During this 30-minute webinar you’ll learn the best ways how to set up PCoIP Zero Clients so your employees or external consultants can be productive from wherever they happen to be. Moving to “The Cloud” is becoming a norm these days as it now provides better security and flexibility that enterprises are looking for in today’s ever growing “Big Data” landscape! Organizations with graphics workloads and interactive applications are looking for ways to consolidate their workstations to decrease CapEx and OpEx while ensuring data security for a disperse and mobile workforce. Alex Herrera, a senior analyst with Jon Peddie Research, author, and consultant to the world’s leading computer graphics and semiconductor companies will talk about on how enterprises can collocate their graphics intensive applications and workstations in the cloud to increase productivity and enhance collaborative working environment for creative professionals and design engineers in various verticals like: Media & Entertainment, Automotive & Manufacturing, Architecture, Engineering, Construction. Teradici's Ziad Lammam will share how Cloud Access Software and PCoIP technology can enable you to securely migrate graphics intensive workloads and applications to the cloud while providing a seamless and “workstation-like” end user experience. Looking for the ins and outs of PCoIP Zero Client profile management with PCoIP Management Console? For ease of PCoIP Zero Client management, the software allows you to create profiles that contain a list of the settings you want to apply to one or more groups of endpoints. Once a profile is configured, you can apply the same criteria to a group or schedule for a future date. During this 30-minute webinar you’ll learn the best ways to create, import and manage profiles. As healthcare organizations look to improve workflows to enable clinicians to spend more time with patients, IT organizations must find ways to keep patient data secure; while providing convenient access. Join us for an informative session on how Imprivata OneSign® Single Sign On and PCoIP Zero Clients have improved clinician productivity and resulted in time savings for IT and medical staff; all while enhancing the security of patient data. Watch a short demonstration on how Teradici PCoIP® Hardware Accelerator smooths CPU peaks to deliver a consistent user experience. Say good-bye to choppy videos or lags using everyday applications thanks to the card’s powerful dynamic workload allocation capabilities. Enjoy full screen HD video playback and immediate performance improvements that can be achieved with PCoIP Hardware Accelerator. Get a glimpse of how you can enhance your VMware® Horizon View environment with the card including reduced CPU overhead. Plus, we’ll share five VDI lessons from our customers. Those who attend and view the webinar will receive a copy of the slide deck and FAQs. Attend this informative session if you would wish to receive tips and tricks to use PCoIP Management Console to get up and running with your PCoIP Zero Clients in five minutes or less. One of the common technical questions our Technical Support team receives is how to best manage security certificates for PCoIP Zero Clients and PCoIP Management Console. This webinar will include a demo illustrating how to deal most effectively with certificates with 10 minutes for Q&A where you can ask our resident expert. The Media & Entertainment (M&E) industry is facing daunting challenges as it evolves to Cloud services from traditional data centers. Until now, there was no viable solution to take existing post-production workflows and transparently move them into a Cloud environment. Attend this webinar to learn how Teradici’s Cloud Access Platform provides one of the most essential building blocks for BeBop to enable digital video editing in the cloud, ensuring flawless performance from any access point and creating a secure editing environment. Join us for this informative webinar to learn how to upgrade your Tera1 PCoIP zero clients to new LG devices, receive 5 free zero clients with money back and feel good about recycling not only your zero clients but laptops, desktops, printers and hard drives. • Earlier this year, LG Electronics USA, was recognized by the EPA on their dedication to increasing consumer awareness about the importance of third-party certified recycling through nationwide education and outreach efforts. • According to the EPA, the positive environmental impact of LG’s responsible recycling is equal to taking 12,300 passenger cars off the road for a year or saving enough energy to power more than 8,000 U.S. homes for a year. The days of ensuring each designer has their workstation under their desk is becoming less the norm. Many organizations, particularly media and entertainment as well as architecture and engineering are considering leveraging the cloud to provide workstations to solve common IT problems resulting from big data sets, a dispersed and flexible workforce as well as increasing concern for data security. Alex Herrera, a senior analyst with Jon Peddie Research, author, and consultant to the world’s leading computer graphics and semiconductor companies will provide guidance on how organizations can develop an IT strategy to deploy and support a secure cloud model, where pay-as-you-go is the norm. Teradici’s CTO will discuss how customers can effectively leverage Teradici PCoIP Workstation Access Software to securely deliver a seamless end user experience from the cloud. Those who attend the webinar will receive a copy of the slide deck. Join us for a riveting discussion with Dell and Teradici customer, Ballinger. Hear how this prominent leader in the architecture space, mobilized and enabled their architects with secure remote access to Autodesk® applications. Ballinger is national leader designing buildings for academic, research, healthcare, and corporate facilities. They will share their journey and how they implemented Teradici’s PCoIP Workstation Access Software with Dell Precision workstations to increase flexibility for their architects with anywhere access to their work, thus helping boost overall productivity. Today, hospitals and healthcare organizations are under increasing pressure to revamp the way doctors and clinicians work and the how patients are treated ̶ IT based solutions across medical units work to make patient treatment and medical professional work more efficient and effective. Join us for an informative session and hear how leading hospitals have reduced IT costs and increased clinical staff productivity. The transition to the cloud poses great challenges to the managed services industry and it is inevitable that some companies will ultimately fail. However, this time of chaos provides countless opportunities for agile MSPs that can adapt, innovate and disrupt the status quo with new solution delivery models. Join Teradici and mspStack to learn about new platforms and technologies that can help you gain the agility to deliver customized cloud solutions and virtual workspaces in a cost-effective way to your customers across different verticals. We power the spectrum of local, remote, mobile and collaborative workstyles, fundamentally simplifying how end-user computing is provisioned, managed and used. Teradici PCoIP technology is deployed end-to-end in virtual and cloud environments, in zero clients, hardware accelerators, standalone workstations and mobile devices. Simple, green, and cost-effective, PCoIP technology delivers a secure, high-definition computing experience.